I don’t know about you but shopping while drinking a glass of wine sounds like a perfect girls day to me. This past Thursday, we were the featured designer at Stumble and Relish’s Sip & Shop Trunk show event. Now before we could start sipping wine, we had lot of planning to do days before the event. We discussed, planned, and debated on which handbags to bring in addition to our current Under the Boardwalk Collection, like choosing neutral colors or the bright pastels or by styles like the Cher wristlet or the Nikki Studded Crossbody. Luckily for us we were in constant communication with one of the owners Jaime who helped us each step of the way. Half the battle was driving across town through rush hour traffic, which was no easy task but we made it on time ready to sip wine and talk handbags. Walking in to Stumble and Relish with all the hanging lights it almost feels like you’re walking into a enchanted forest, decorated with beautiful paper lanterns all around the whole store. I noticed the decorations and window display stopped everyone on the streets and brought in customers consistently. No questions asked, I knew Stumble and Relish customers would love Brynn’s bag but working these events, you never know what colors will be among the favorites. Sure you can try to guess but like every event, each one is different and so are the customers too. You never know which color or style bags will catch their eyes. Among the most popular of the night was the Eclipse Mini Lauren Convertible Crossbody and the Caviar Nikki studded Crossbody and everything in the Cape Cod. No surprise, people loved the Mini Lauren for all the ways you can wear it, the backpack style always grabs peoples attention. By the end of the day, I was happy to hear all the amazing feedback about the handbags from the customers, this is what I especially love about working as the merchandising intern. I can’t wait to work the next event, especially if it involves free wine! 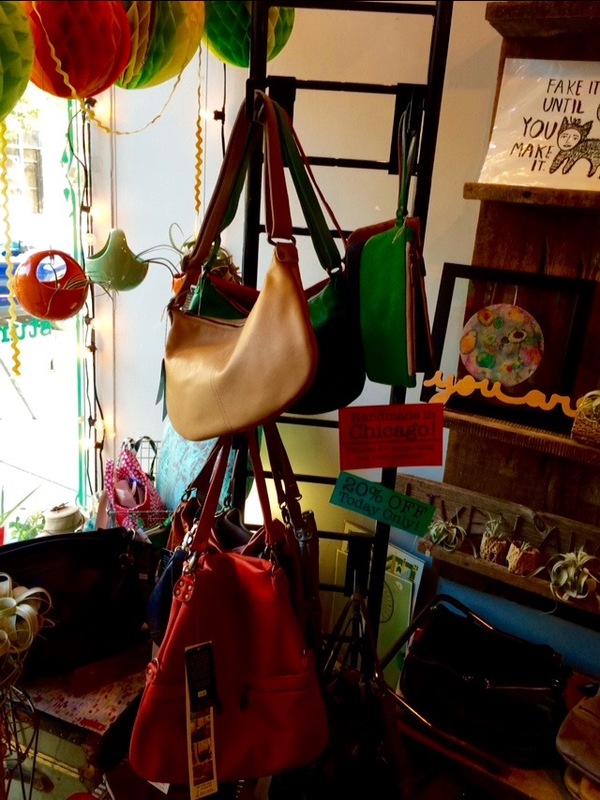 Tags: bohemian, Brynn Capella Handbags, Chicago events, City Life, Italian Leather handbags, Made in the USA, merchandising intern, shopping, Sip & Shop, Stumble and Relish, Summer Event, Trunk Show, wine. Bookmark the permalink.